Bacon Cheeseburger Cupcakes - only 4 ingredients! Refrigerated pizza crust, frozen meatballs, precooked bacon and cheese. Ready in minutes! Great for a quick lunch, dinner or tailgating!! Everyone loves these! Can freeze leftovers for later. 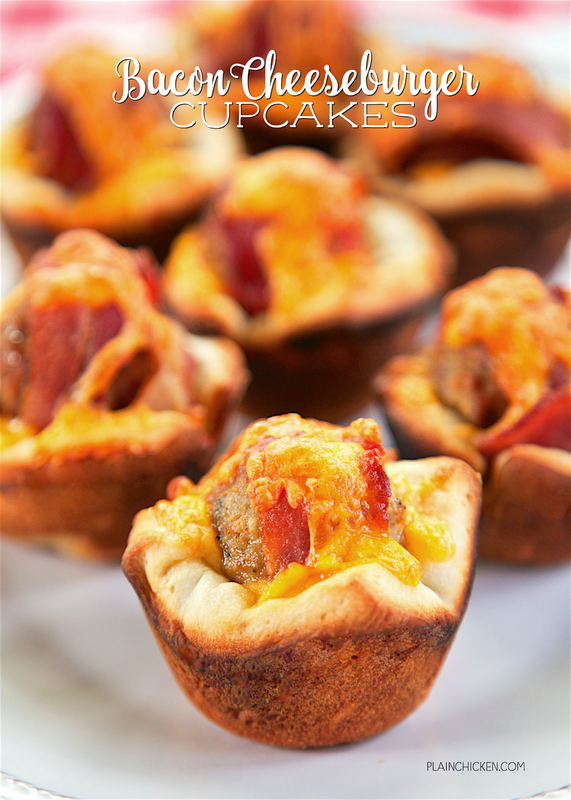 These Bacon Cheeseburger Cupcakes are great for lunch, dinner and tailgating! We ate them for lunch the other day and had the leftovers for dinner. We loved them! 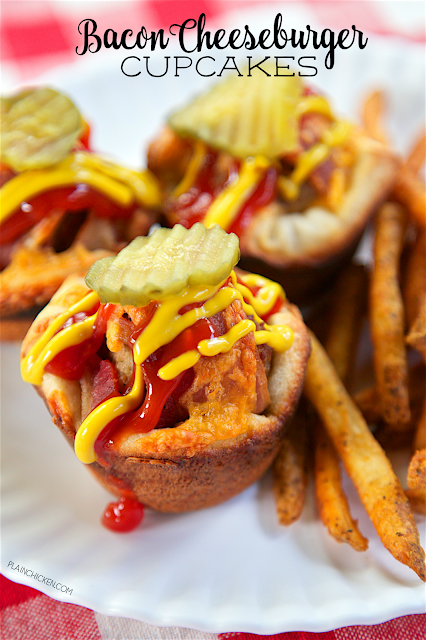 We topped them with some ketchup, mustard and pickles. YUM! These Bacon Cheeseburger Cupcakes are very simple to make. There are only 4 ingredients - refrigerated pizza crust, frozen meatballs, precooked bacon and cheese. They come together in a minute. It only took about 20 minutes from start to finish. Perfect for a quick lunch or dinner. You can freeze the leftovers for later. Preheat oven to 375. Spray 12 regular size muffin cups with cooking spray. Set aside. Remove dough from can; press into an 8x18 inch rectangle. Cut dough into 12 squares. Press squares into muffin pan cups. Place 1 tablespoon of cheddar cheese in the bottom of each muffin cup. Wrap one piece of bacon around each meatball. Place meatballs on top of cheese. Sprinkle with remaining cheddar cheese. Bake 12 to 15 minutes, or until golden brown.